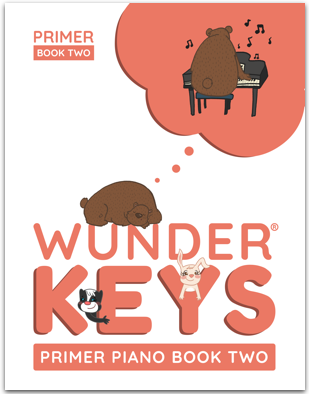 Jam-packed with age-appropriate piano pieces, off-the-bench activities, and game-based learning, WunderKeys Primer Piano Book 2 reinforces keyboard awareness and note reading in an environment carefully crafted to meet the physical capabilities of young piano students. The book’s engaging illustrations, hilarious dialogue, and step-by-step scaffolding approach combine to create the resource that piano teachers, piano parents, and piano students have been waiting for. In WunderKeys Primer Piano Book 2, students will continue an exploration of the keyboard, build hand strength and coordination, identify notes on the grand staff using guide notes, explore stepping and skipping on the staff and the keyboard, use finger-number clues to identify starting positions, read rhythmic notation, strengthen aural awareness and begin to acquire confidence playing “out of position” WunderKeys Primer Piano Book 2 is the second in a series of three primer piano books. Primer Piano Book 3 Coming Soon!